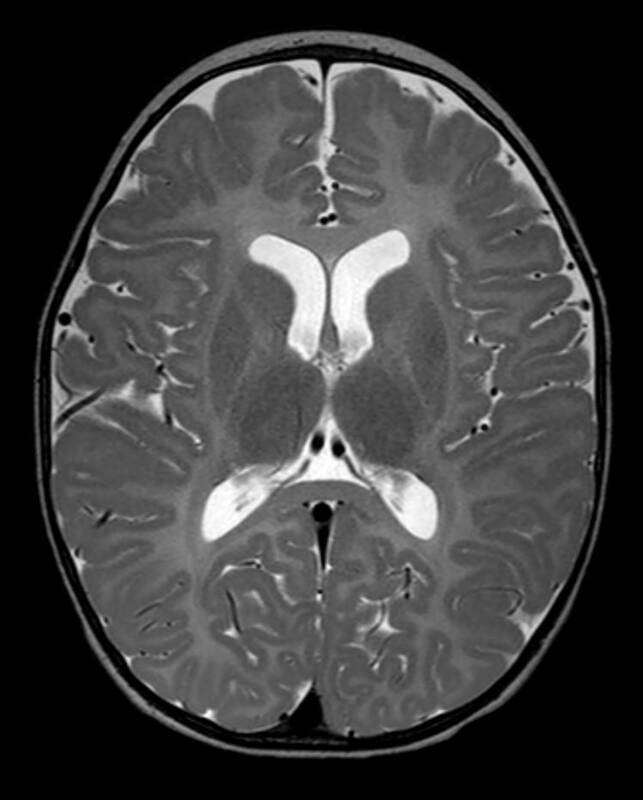 A 4-month-old male first presented at an outside hospital with macrocephaly and nystagmus. The non-contrast enhanced CT of the head and an MRI of the brain without and with contrast performed at that time were normal. The patient returned at 15 months of age with continued developmental delay. 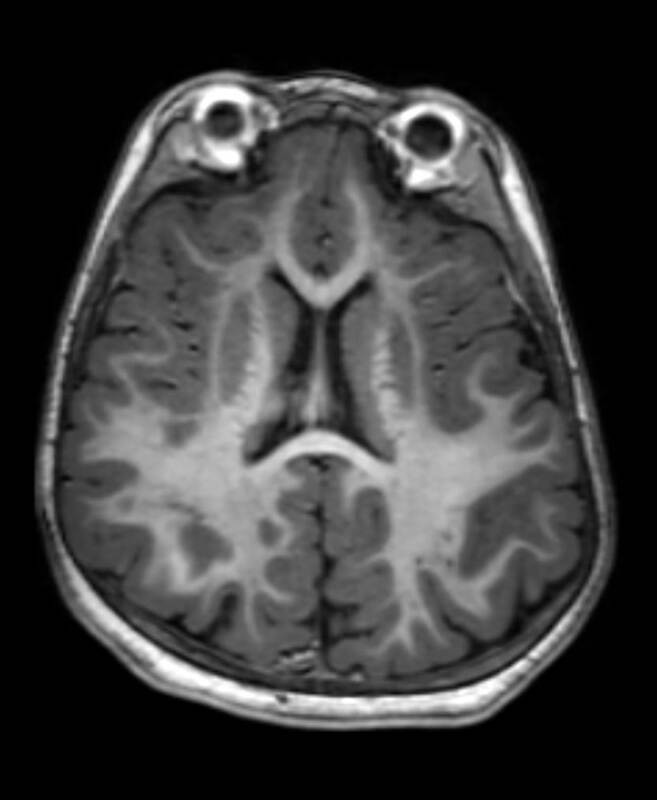 Axial T1-weighted images of the brain (Figure 1; image of a normal brain provided for comparison) demonstrate diffuse delayed myelination with the major tracts (such as the corpus callosum, anterior limb and genu of the internal capsule, and periventricular and subcortical white matter) appearing isointense to hypointense compared to gray matter. The posterior limb of the internal capsule does show some myelination. By 12 months of age, the expected myelination on T1-weighted images should closely resemble the adult pattern with white matter appearing hyperintense to gray matter due to its high lipid content. 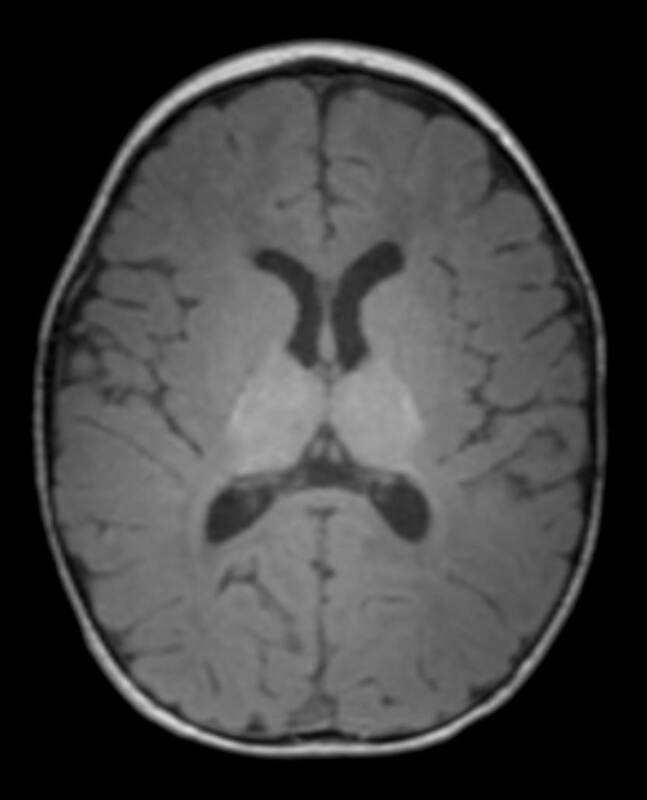 Sagittal-T1 weighted images (Figure 2; image of a normal brain provided for comparison) show a small corpus callosum with near complete absence of myelination. Only minimal myelination is present within the body and splenium of the corpus callosum. T2 weighted images (Figure 3; image of a normal brain provided for comparison) show hyperintense T2 signal in the corpus callosum, internal capsule, and periventricular and subcortical white matter consistent with earlier stages of brain development. Normally, in a 15-month-old, the corpus callosum, internal capsule, and periventricular and subcortical white matter is hypointense to gray matter on T2-weighted images. The differential diagnosis includes other primary hypomyelination syndromes such as spastic paraplegia type 2, hypomyelination with atrophy of basal ganglia and cerebellum, 18q syndrome, Jacobsen syndrome, hypomyelination with congenital cataracts and hypomyelination with trichothiodystrophy. Classic PMD has X-linked recessive heritance and occurs exclusively in males. This form begins during late infancy and occurs more often than the connatal form. The connatal form can be autosomal or x-linked recessive and girls and boys are equally affected. This form is a more severe variant and begins at birth or early infancy. Patients with all forms of PMD present with nystagmus, hypotonia, extrapyramidal hyperkinesias, spasticity, and slow psychomotor development.3 Symptoms progress with time and patients usually die during early or mid-adulthood. On CT, PMD appears as diffuse low attenuation in the white matter with progressive diffuse atrophy. On MRI, there is diffuse lack of myelination with no white matter destruction. The amount of myelination and volume of the white matter slowly diminish over time. The cerebellum may also become markedly atrophic. Myelination results in shortening of T1 and T2 relaxation times, thus, as tracts myelinate, they become more hyperintense on T1-weighted images and more hypointense on T2-weighted images. Typically, T1-weighted images are more useful for determining the myelination pattern in children less than 10 months of age. Because the white matter structures become hyperintense in a predictable order, pediatric neuroradiologists can compare the myelination pattern to normal controls to assess maturation. Key areas to assess are internal capsule, pyramidal tracts, optic radiations and frontal lobe white matter. Normally, the adult pattern of myelination on T1-weighted images occurs by 1 year of age. T2-weighted images are most useful for determining the myelination pattern after 10 months of age. In these patients, the T2 shortening reflects displacement of interstitial water by myelin wrapping on axons. Myelination on T2-weighted images is complete by 3 years of age. Currently, no cure or standard treatments are available for PMD and the disease is universally fatal. Gene therapy and cell transplantation are being explored as possible therapies in US and China. Pelizaeus-Merbacher is a rare leukodystrophy characterized by global delayed myelination resulting from an inherited mutation in the proteolipid protein gene and abnormal formation of proteolipid. The classic form occurs exclusively in males and should be considered in the differential diagnosis of developmental delay with positive family history. The key to diagnosing PMD is understanding the normal myelination pattern of the brain. Chung EM, Travis MD, Conran RM. Pancreatic 1. Barkovich A, Raybaud C. Pediatric neuroimaging. 5th Edn. 2012. Lippincott Williams and Wilkins, Philadelphia, PA.
Barkovich A, Moore K, Jones B et al. 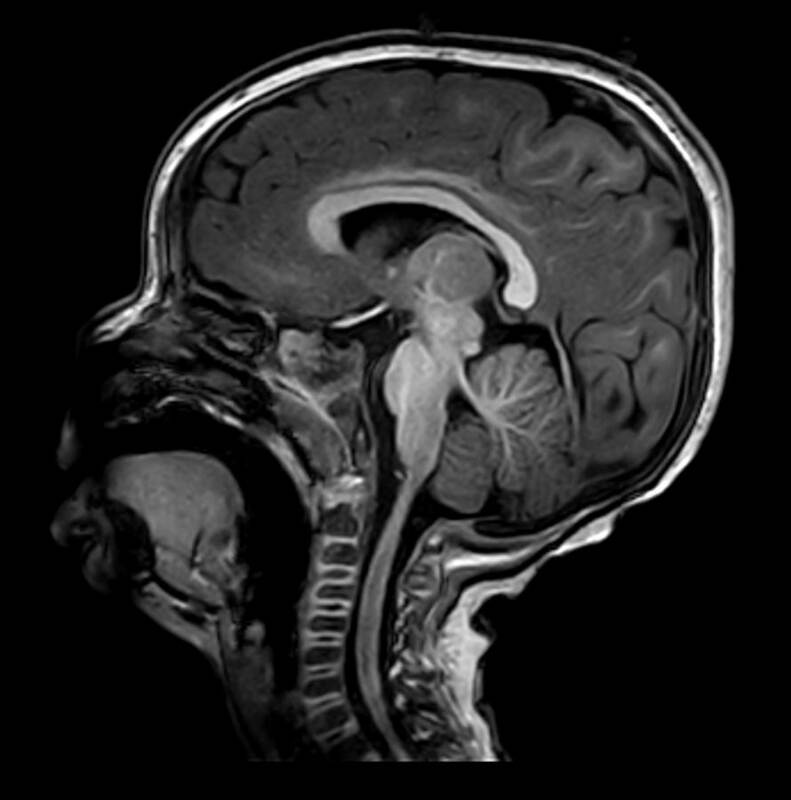 Diagnostic imaging in pediatric neuroradiology. 1st Edn. 2007. Amirsys Inc, Salt Lake City, Utah. Cheon JE, Kim IO, Hwang YS et al. 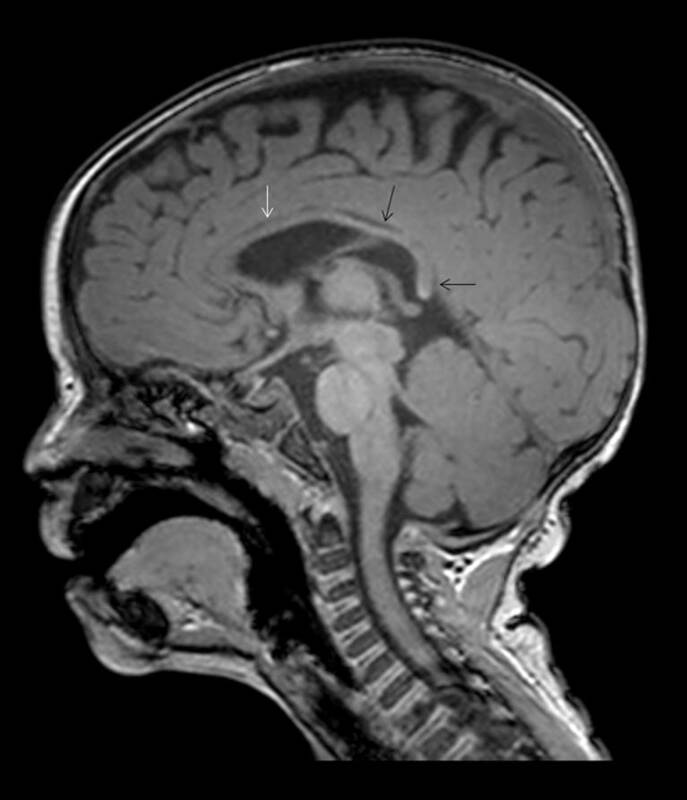 Leukodystrophy in children: a pictorial review of MR imaging features. Radiographics. 2002;22:461-476. 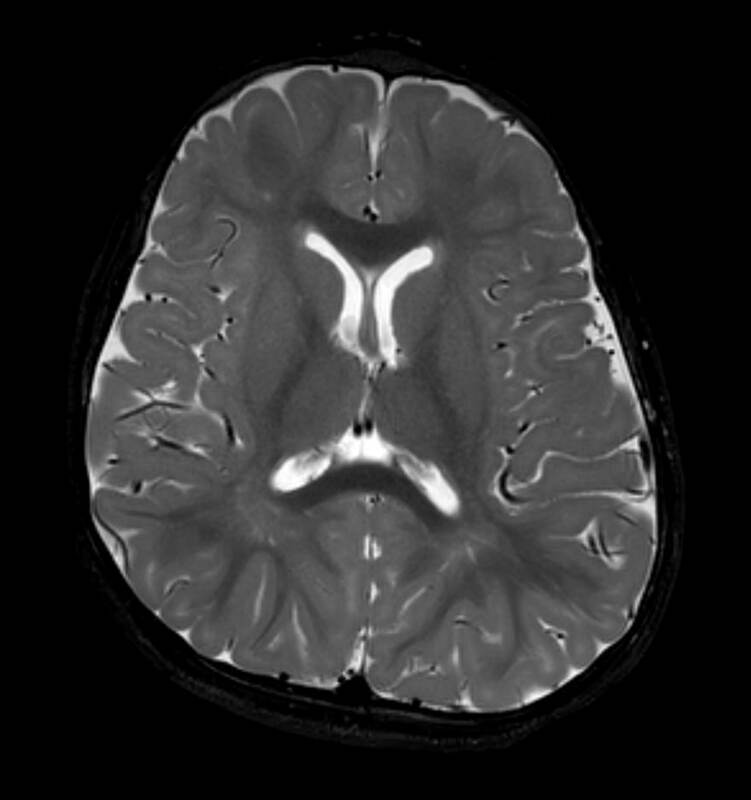 Pediatric Radiological Case: Pelizaeus-Merzbacher syndrome. Appl Radiol. Prepared by Dr. Cornejo, Dr. Jorgensen, Dr. Naidu, and Dr. Richard Towbin while at the Diagnostic and Interventional Radiology Department, Phoenix Children’s Hospital, Phoenix, AZ, and by Dr. Alexander Towbin while at the Department of Radiology, Cincinnati Children’s Hospital, Cincinnati, OH.